Elijah or Elias (Hebrew: אליה, ʼĒliyāh; Greek: Ἠλίας, Ēlias; Arabic: إلياس, Ilyās; "Name means::YHWH is God") (fl. 918-896 BC according to Ussher, or 874-852 BC as may be inferred from Thiele) is the best-known and probably the greatest prophet of God of the Old Testament era — and certainly the greatest prophet of the era of the Divided Northern and Southern Kingdoms. Ironically, he holds this distinction even though he does not have a book of the Bible to his name. He is a by-word for courage-under-fire and for willingness to challenge the established order. His record is by no means perfect, but even the one episode of failure-of-nerve is an instructive example. 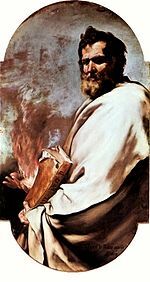 Elijah holds another distinction, of being the only man who ever lived (aside from Enoch) to enter into the next life without directly tasting death. Prophecy holds that he will return by a specific gate of the Temple of Jerusalem. The contemporaries of John the Baptist once asked him whether he himself was Elijah (he denied this). Students of eschatology, or at least those who hold to a futuristic interpretation of end-times prophecies, hold that Elijah will return again to this world, in the company of Enoch (or Moses), to give a pivotal testimony in Jerusalem. The Bible says nothing of Elijah's origins, other than describing him as a "Tishbite." This presumably means that he was born in the city of Tishbe in Gilead. Some have suggested that Elijah was not the name that this man was born with, but was one that he chose himself, to express the all-encompassing importance of his mission. That mission was to speak the truth of God to a power on earth — specifically, that of King Ahab of the Northern Kingdom, and Ahab's even more wicked queen Jezebel. Elijah's first public pronouncement, probably during the ninth year of the reign of Ahab, was to swear by God that neither rain nor dew should fall upon the Northern Kingdom until he, Elijah, said that it was time. He would never have made a pronouncement like that without direct Divine orders. Shortly thereafter, God ordered Elijah to hide by the brook called Cherith, and drink from it, and to eat the morsels that the ravens brought him. Elijah did so for at least one day, until the brook dried up from the drought that he had earlier pronounced. God's next command to Elijah was to go to Zarephath and there seek lodging from a widow and her son. He found this widow despairing over the failing food in their household, and announcing that she was about to prepare her and her son's last meal. Elijah asked her to feed him first, and then herself and her son--because God had promised that her provisions would not give out until the day that God saw fit to cause rain to fall again. True to Elijah's word, the widow lacked for no provision during the next several days that Elijah lodged in her house. Three years later, Elijah received word from God to present himself at court, because God was now ready to allow the rain to fall again. The meeting took place in this way: Ahab summoned the palace steward, Obadiah (who had in fact helped a hundred prophets hide themselves in two groups of fifty), and asked him to help search the land for any blade of grass that might still be growing. Obadiah, while conducting his part of the search, happened upon Elijah and prostrated himself before him. Elijah ordered him to go tell Ahab that Elijah had arrived. Obadiah was afraid that Ahab would execute him summarily, because Elijah was at the moment the most hunted and wanted man in all the Northern Kingdom. Elijah assured Obadiah that he would meet Ahab at any agreed-upon place. Ahab met Elijah and at first asked him, "Are you the man who has troubled Israel?" Elijah answered, in effect, that if either man had troubled the Northern Kingdom, Ahab had, with his Baal worship. He then issued the king a challenge: that everyone in the kingdom should come to Mount Carmel, together with 450 prophets of Baal and 400 prophets of Asherah. There Elijah would prepare a demonstration. At the appointed time and place, Elijah said that the people must stop worshiping two different gods — that they must either follow God, or follow Baal. He then challenged a side-by-side test of the efficacy of these two gods — that the Baalists would prepare a sacrifice of a bullock, and Elijah would do likewise; they would put no fire underneath the altars, but each would call on his respective god to light the fire. The Baalists and Asherists prepared their sacrifice and cried out incessantly to Baal from morning until noon. Elijah then mocked them and suggested that they cry more loudly. They did, and even cut themselves so that they bled profusely. All of this was to no avail. Evening came, and Baal had provided no fire. Now Elijah built an altar of twelve stones (one for each tribe) and prepared his own sacrifice. But he also ordered a trench dug around the altar, and then ordered the meat and the wood for the fire drenched with four barrels of water — and not merely once, but three times. The water from these three washings drained into the trench. Then he prayed very simply for God to send His answer. Fire (some say lightning; others suggest that it was a purely miraculous fire) came down from heaven, with sufficient force to consume the sacrifice, the wood, and the stones, and to dry up the water that had drained into the trench! Instantly the onlookers cried out, "Yahweh is God!" Now Elijah ordered the spectators to arrest the Baalists (and, presumably, the Asherists, too). This they did, and Elijah had them brought to the Kishon brook and summarily executed. Jezebel, when she heard the story, reacted in cold fury. She sent a message to Elijah, saying coldly that she hoped that her own gods would execute her, in just such a demeaning manner, if she did not have Elijah executed in the same fashion as he had executed the Baalists. Faced with this brazen defiance, Elijah's nerve failed him. He fled to Beersheba, left his servant in that city, and went a day's journey further into the desert. He actually prayed to God to take his life — because, quite simply, he thought himself a failure. Twice an angel provided him food and drink, so that Elijah journeyed for forty days and forty nights to the foot of Mount Sinai (or Horeb). He hid in a cave, and there God asked him, "What are you doing here?" In reply, Elijah protested that the people of the Northern Kingdom had broken their covenant with God, killed his prophets, and now sought to kill him. God told him to climb the mountain, and when Elijah did, God provided three separate demonstrations of great power. Then God asked him again, "What are you doing here?" Elijah gave the same answer as before. Now God gave Elijah specific instructions and a reassurance. The instructions were to travel to Damascus and there anoint with oil three specific persons: Hazael of Syria, who would eventually succeed the present king, Benhadad; Jehu son of Nimshi, who would eventually take over the Northern Kingdom; and succeeded by::Elisha son of Shaphat, who would succeed Elijah himself as God's chief spokesman. The reassurance was that God still had a remnant of believers, seven thousand in all, who had not turned to the Baal worship that Ahab and Jezebel had brought to the Northern Kingdom. King Ahaziah fell through a latticework and injured himself. He then consulted a prophet, not of God, but of Baalzebub (literally, "Lord of the Flies"). Elijah met Ahaziah's messengers and asked them pointedly why he would ask advice of a pagan god instead of the true God? He then told the king's men that Ahaziah would not so much as rise from his bed, but would die on it. Elijah's recall to heaven occurred shortly after the death of King Ahaziah; this we may surmise because of a role that Elisha would play in a battle in which Jehoshaphat took part, in a coalition with King Jehoram. Elijah summoned Elisha and asked him to wait for him, first at Bethel, then at Jericho, and finally at Jordan. There Elijah took off his mantle and struck the waters, which then parted and allowed Elijah and Elisha to cross on a dry riverbed. Fifty witnesses watched them do this. On the other side, Elijah asked Elisha what sort of last favor Elijah might grant him. Elisha asked for "a double portion of thy spirit." Elijah said that he would be able to grant that, if Elisha would be able to see him during his rise to heaven. Then a chariot and team, all of fire, appeared, and Elijah mounted it and went away from the earth. The last thing he did before he disappeared completely was to drop his mantle for Elisha to take. The author of I and II Kings never mentions Elijah again, but the Chronicler does. II Chronicles states that a prophet named Elijah wrote to King Jehoram of the Southern Kingdom, telling him that he would die a disgusting and ignominious death for importing Baal worship to that kingdom. Who was this prophet named Elijah? More to the point, when did this Elijah write that letter? This same Elijah wrote this letter seven years before the fact and left strict instructions to deliver it when, as, and if any such fratricide occurred. None of these alternatives is impossible, and perhaps no one alternative is any less likely than any other. A prophet can as easily predict the event he is protesting as he can the consequences of that event. Nor would this be entirely without precedent. Moses was a prophet as well, and received word from God that the Pharaoh of Egypt would not obey God's word to "let My people go." Moses therefore knew well in advance that Pharaoh would need some brutal convincing. The prophet Malachi predicted that Elijah would return to herald the coming of the Messiah. Malachi 3:1 ; see also Malachi 4:5-6 . The contemporaries of John the Baptist asked whether he himself was Elijah. John denied this. Jesus Christ said to his disciples that those Jews who were waiting for Elijah to return, failed to note that Elijah had already come, but they hadn't recognized him. His disciples understood Him to identify John the Baptist as that man; perhaps He was speaking parabolically when He said this. At the episode known as the Transfiguration of Jesus, both Moses and Elijah appeared to Jesus while He stood in all His glory. The Bible does not tell us the content of that conversation. To shut heaven and cause the rain to fail. Both of these abilities recall key events in Elijah's career. In addition, Revelation says that they will have power to turn water into blood, an obvious reference to the Ten Plagues visited upon Egypt by Moses. These references have led many to conclude that Elijah and Moses are the two witnesses in view here, and that they will herald the return of Jesus Christ as a judge of the living and the dead. Elijah Conservapedia's article on Elijah. This page was last modified on 4 December 2009, at 20:33.